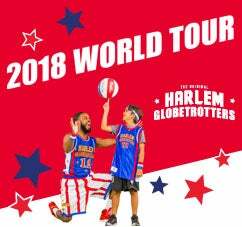 ) On the heels of taking their unparalleled entertainment to capacity crowds overseas, the Harlem Globetrotters will return to North America with their one-of-a-kind show to Fayetteville, North Carolina at the Crown Coliseum on Saturday, November 3 at 1:00pm. Tickets start at $27 and are now available at harlemglobetrotters.com, Capefeartix.com, by phone at 888-257-6208, or at the Crown Coliseum box office and the Leisure Travel Office located on Fort Bragg. For more information, please visit harlemglobetrotters.com.